Now that winter weather has arrived, you won't find me trying to jog outside when it's 28 degrees. However, for those occasional days when it hits 45-55 degrees, I'm all for jogging as long as I'm dressed in base layers. 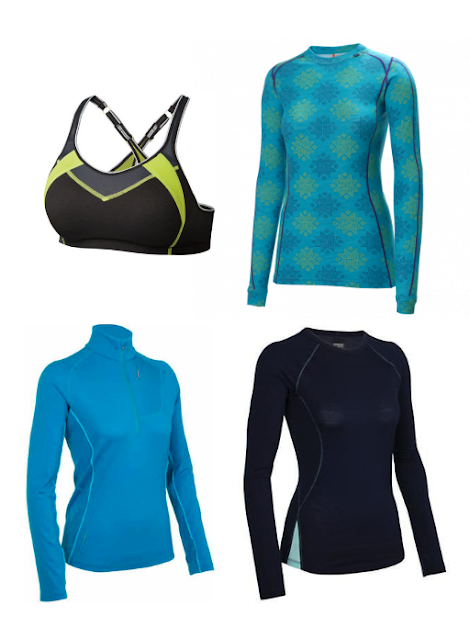 Whether you are jogging, playing sports outdoors, or heading out to a football game, Moving Comfort, Icebreaker and Helly Hansen has cold weather activewear to help you keep warm this season. Moving Comfort Urban X-Over ($42) is one of the most comfortable sports bras I've ever tried. It is sized by band/cup size, has cross-back adjustable straps for a custom fit and S.Cafe lined cups that wick sweat and eliminate odor. The Urban X-Over has seam-free, contoured cups that give you shape instead of making you appear flat even after layering on your workout wear. It's ideal for high-impact activities like running or tennis. I also love the pop of color added to this bra. To help you find the perfect fit, check out Moving Comfort's sports bra fit guide. Icebreaker has been a favorite of mine for years, because their XS fits so well. The Icebreaker Bolt Long Sleeve Crewe ($89.99) is made with high-performance merino base layers and a touch of LYCRA for an athletic fit and faster dry time. It's naturally odor-resistant and breathable and keeps you warm in the cold, and cool in the heat. The Icebreaker Dart Long Sleeve Half Zip ($139.99) is made of merino wool and water resistant nanotechnology to keep you comfortable and dry. It's idea for running & fitness or snow sports. The zippered chest pocket is perfect for storing my keys. I easily wear the half zip over my base layer crewe without feeling bulky since both of these pieces are lightweight and fitted. I'm new to Helly Hansen and would recommend their HH Warm Ice Crew ($80.00), the perfect technical top for colder weather aerobic activity. The long-sleeve base layer is made with LIFA Stay Dry Technology, merino wool exterior for superior insulation and moisture-wicking properties to keep you warm and dry. It also has a 2-in-1first and second layer feature and comes in a variety of colors and prints starting in size XS.